I really enjoyed making this super craft with the kids, they had a BAM, BOOM, BLAST too! 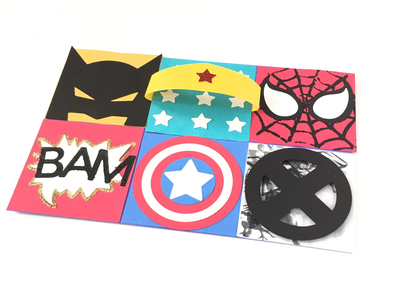 Make a collage of several characters from the marvel and DC world. The favorites are here Batman, Spider-Man and Captain America. 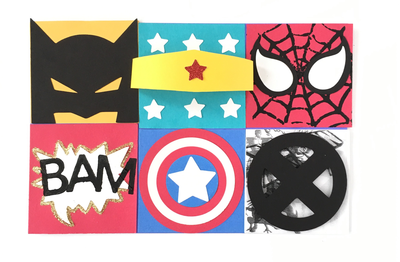 Each square is a 3"x3" piece of colored paper that make up the marvelous collage. 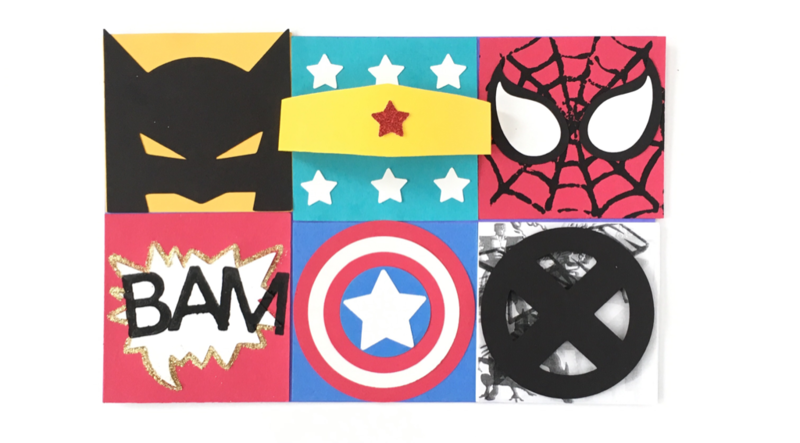 Team up your favorite heroes and think basic shapes and craft punches to create this project. If you're a Cricut or cutting machine user then even better. Step 1. Cut out your background at 9"x6" along with some colored squares at 3"x3". Next start creating your shapes to glue onto your squares. I created Batman's head by combining simple shapes in the Cricut design space then cut him out. I found a leaf/raindrop shape to use for Spider-Man's eyes. I found a shield shape that I stretched for Wonder Woman's tiara. The "X" I created by combining a hollow circle with long rectangles. The word balloon was a free shape. 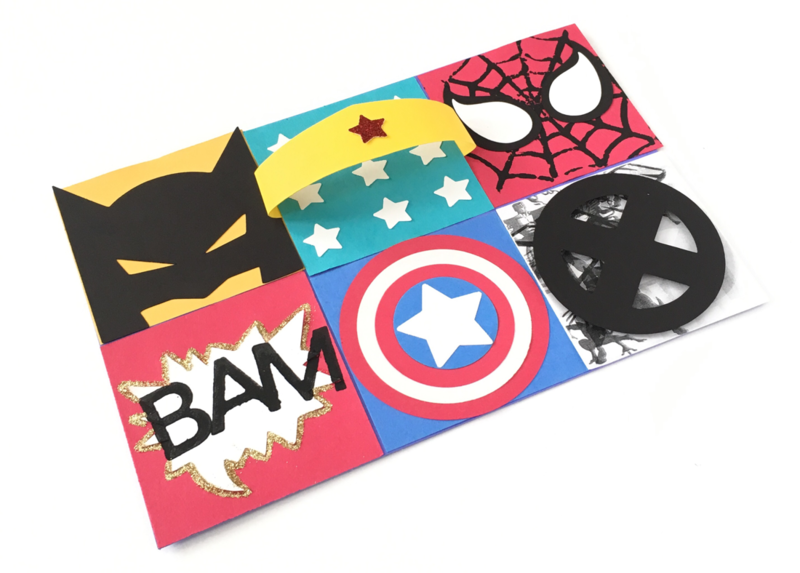 Captain America's shield was made with 4 different sized circle craft punches and a star punch. Step 2. 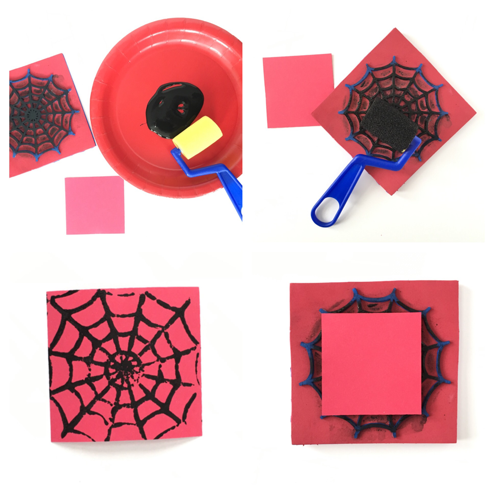 I made the Spider-Man web stamp by cutting out a web shape on a craft foam sheet using the Cricut. Then I glued it to two pieces of foam to form the stamp. Once you're ready to stamp pour some black paint into a plate and use a mini roller to apply the paint. Place the paper on top of the stamp instead of flipping the stamp over like you'd normally do. step 3. I added 3D foam squares to the "X" to make it pop out a bit. The X-Men background was made using a free font from dafont.com, which I printed and copied on a photo copy machine, you can just print out images and make a mini collage, or use cut up old comic books. 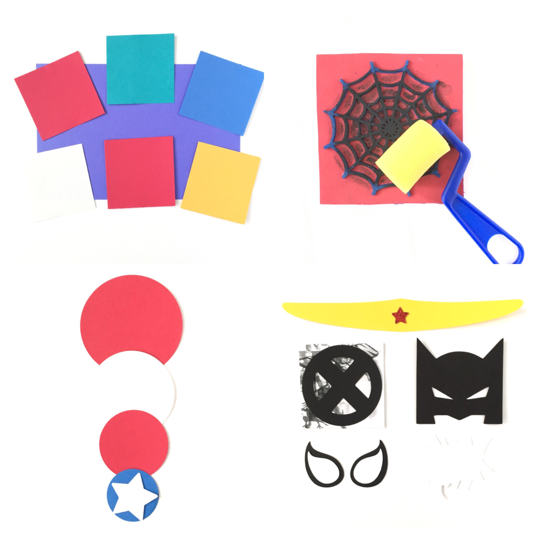 Punch a little red star for Wonder Woman's tiara and white ones for the background square. Wrap the tiara around the square and glue to the back. step 4. 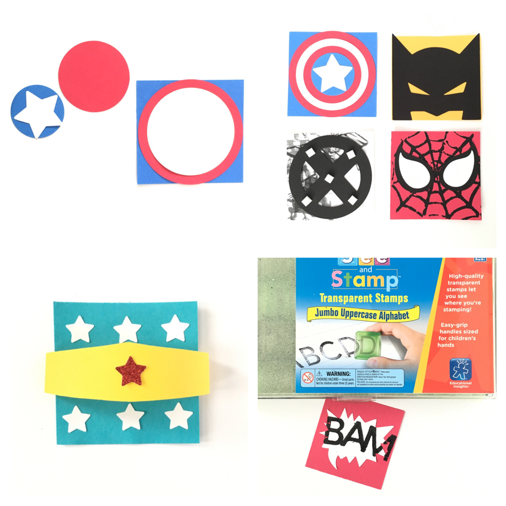 Lastly I used uppercase letter stamps to add the "BAM" to the exploding word balloon and assembled my entire project.